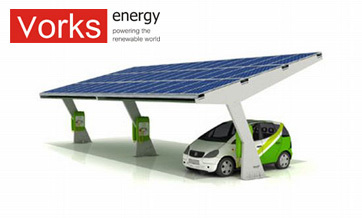 Vorks Energy's Photovoltaic Solar Shade Structures are parking canopies with a roof specifically designed to provide low-cost support for a solar power system. A visible display of a companys commitment to renewable energy, the solar shade structures can be used throughout the day to generate electricity and can be complimented with lighting and security cameras for safe usage at night as well. Solar Panels can be put to effective use by installing them on the Bus Shelters. They generate electricity throughtout the day which can be effectively used for lighting signages and billboards at night.